Infrared remote control receiving and sending is a great thing to play with on a computer. You don’t need a Pi to do this but its a lot more verstile than an Arduino and since the PiZero is only £10 (Pi + SD card) – the extra cost over an Arduino clone is well worth it. And best of all – the extra hardware needed – a 3 pin IR receiver and a 2 pin IR sending diode for £1 in total is great VFM. You may be thinking – what can I do with such a combo. Well the list becomes as long as your imagination. So I programmed my Arduino to listen out for these unused codes and then trasncode them into useful commands that my DVD player understood. This avoided the need to have the DVD remote around and saved having to buy a universal All-in-100 remote. And of course, it was FULLY customisable. Last month, I decided to look into what software was available for the Pi and discovered the LIRC project which works on all Linux computers. So I installed and configured it and am using it to transcode my old Sky+/SkyHD remotes to control my new SkyQ box (Mr Sky decided to make the old ones incompatible with the new system). I’ve another Pi that is listening out for Cheelight colours and beaming IR codes out to my garden solar RGB lights. 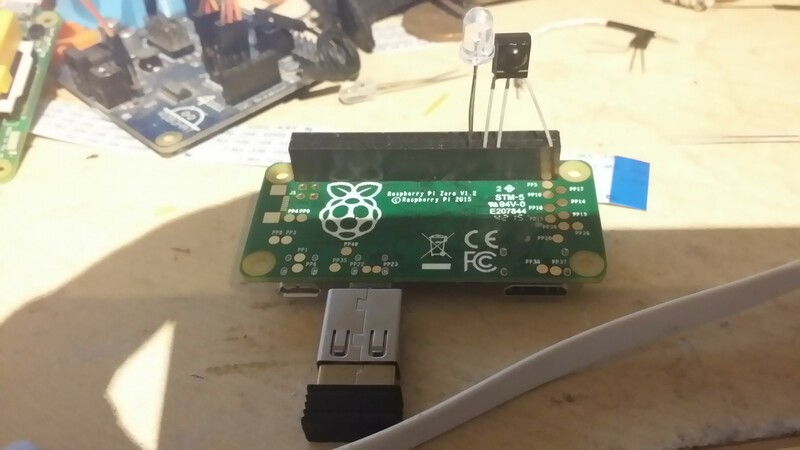 I configure my PiZero to reciever on Pin11 (GPIO17) and transmit on Pin13 (GPIO27) but thats only because that’s the easiest wwiring method for me with my extended header poking out the bottom of my Pi. LIRC takes some getting used to – its not very intuitive but it works! There is also joan’s PiGPIO simpler solution which doesn’t need all the configuration that LIRC does but has some limitations and issues and can’t do anything complicated (yet).